The Grampians region is one of the main highlights for visitors to Victoria, and it is easy to see why. This beautiful national park near Melbourne offers some of the most stunning and dramatic scenery in Australia, with rugged sandstone mountains, vast volcanic plains and a huge variety of natural wildlife. The outstanding natural beauty of the Grampians even secured the national park a place on the Australian National Heritage List. 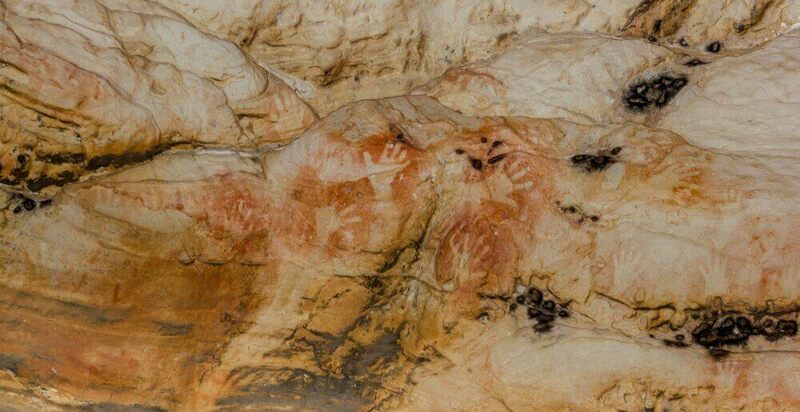 While the Grampians is mainly known for its spectacular scenery and the quality of the hiking here, this region also offers a fascinating insight into the indigenous history and culture of Australia, as it contains one of the richest collections of Aboriginal rock art in the country. In addition, it is a major wine region where some of Australia’s best-loved wines are produced. While it would take a long time to explore the Grampian Ranges in the detail they deserve, here are some of the main activities to enjoy, and places to visit, in the Grampians if you are only here on a short tour. Hiking is one of the most popular pastimes in the Grampian Ranges, as it offers the perfect way to explore the stunning scenery and diverse wildlife of the area. However, there are so many hiking trails to discover here that it is difficult to explore the area properly in one day, which is why many hikers choose to do a Grampians two day tour. You can reach the Grampians from Melbourne in under three hours by car, and stay overnight in one of the local towns such as Ararat or Horsham, which offer easy access to the main hiking trails of the national park. There are a number of highlights for hikers here. Mt Sturgeon is one of the most popular local hiking spots, with a spectacular walking trail taking you across stretches of water, over rocky terrain and through beautiful forestry on your way to the summit. 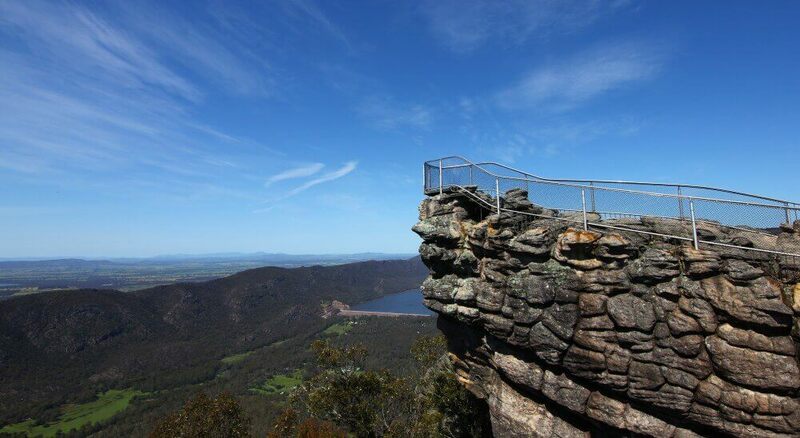 The climb is tough but well worth the effort, as from the top you can take in stunning panoramic views across the mountains and the vast volcanic plains of the surrounding area – the Mt Sturgeon Grampians views are truly hard to beat. Mt William is another essential hiking destination, as its summit is the highest point in the entire national park, standing 1,167 metres above sea level. It is probably the best vantage point for seeing the entire national park from one spot. However, you do not have to climb the whole way – if you want to take in the views without a tiring hike, you can reach the summit in 45 minutes from the car park. Another popular spot along the hiking trail is the lookout point known as the Balconies, which offers spectacular panoramic views across the Victoria Valley. This spot is a favourite with photographers as well as hikers, and it can be enjoyed to best advantage at sunrise and sunset, when the scenery is lit up in dramatic pink and golden shades. 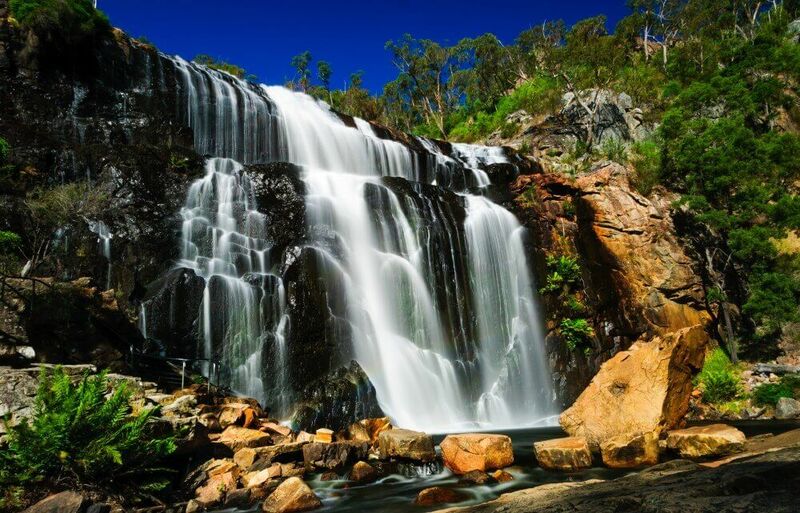 One of the best-known and loved landmarks in the entire national park, MacKenzie Falls is an essential stop, even if you are only on a Grampians day trip. This is the largest waterfall in Victoria, cascading for 35 metres down the ancient rocky cliffs into the deep pool below. This impressive display can be enjoyed all year round. The Falls can be viewed from the base via a steep but beautiful walking trail; or if you prefer easier access, choose the viewing platform at the Bluff, which enables you to take in the waterfall in all its glory, including the rainbow-tinged spray that rises from the Falls. The Grampians region is known as Gariwerd to the Aboriginal people who have been connected to the region for thousands of years. This history can be seen in a number of places throughout the area, which contains a total of 60 rock art sites, one of the largest concentrations in Australia. Some of the best example include the Ngamadjidj Art Shelter, which features a procession of ghostly white figures on the wall; Gulgurn Manja, covered in the red handprints of the children of the time; and Bunjil’s Shelter, named after the legendary creator of the land, where Bunjil is depicted alongside his two dingo companions. The indigenous history of the Grampians can also be explored through a visit to the Brambuk National Park and Cultural Centre, Australia’s longest-running centre dedicated to Aboriginal culture. It offers an insightful and fascinating way to explore the traditions and history of the region through displays of art and artefacts, while also providing visitors with the opportunity for some hands-on fun, with boomerang painting sessions and didgeridoo workshops. A must on any Grampians day trip! The Grampians national park is home to a huge variety of native wildlife, including kangaroos, koalas and emus. If you are lucky, you might be able to spot some of these beloved animals in their natural habitat while you are touring the park. However, animal lovers need never be disappointed here, as the Grampians is home to Halls Gap Zoo, the largest regional zoo in Victoria, which houses over 160 species of animals from Australia and around the world. 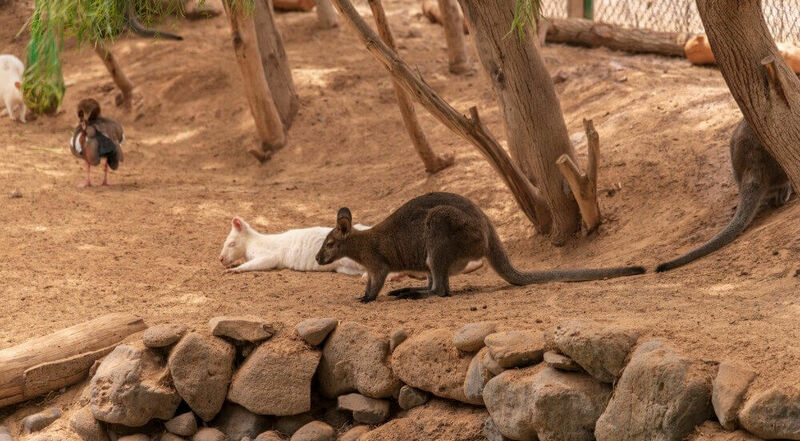 Kangaroos and wallabies can be found alongside meerkats, giraffes, lemurs, rhinoceros and many more. You will also get the chance for some close encounters and photo opportunities with your favourite animals, and be able to find out more about the important conservation work the zoo does for animals in the region. 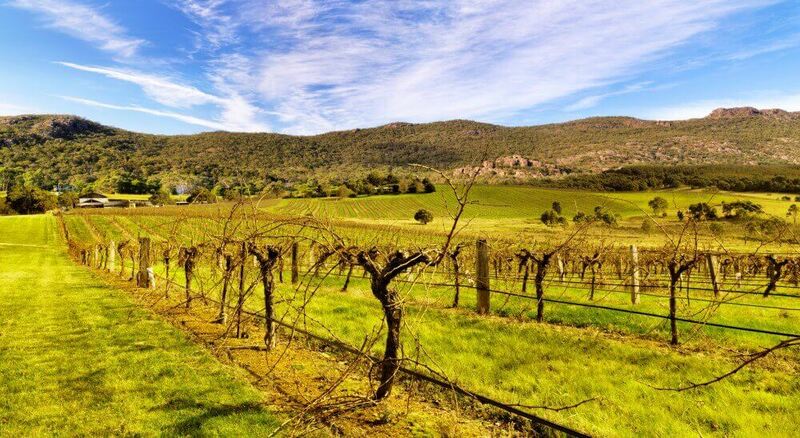 The Grampians region is well-known as one of the top wine-producing regions in Australia, and Grampians wine tours are extremely popular with visitors to the area. In total, there are over 15 wineries in the Grampians, producing a top-quality selection of red and white wines to suit all palettes. Mount Langi Ghiran is a particular favourite destination for wine lovers, as it produces one of Australia’s best-loved wines, the Langi Shiraz, which has been produced here since 1870. The cellar door is a real highlight here, giving you the opportunity to sample this iconic local delicacy. However, the vineyard itself is spectacular in its own right, nestled in a secluded spot against the dramatic scenery of the Great Dividing Range mountains. The area local to the Grampians contains a number of towns which make ideal stop-over points if you are enjoying a Grampians two day tour. 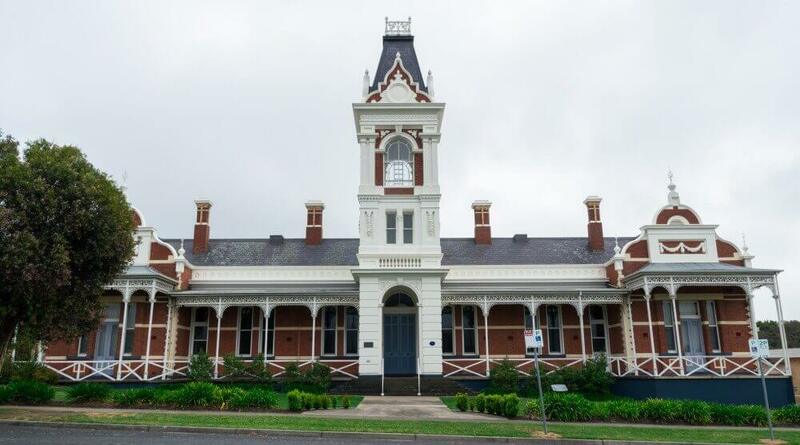 These towns, including Ararat and Stawell, enable you to experience the region’s Gold Rush history, as many of the buildings here date from the 1850s and 60s, when plentiful supplies of gold were found in the area. Stawell is a traditional European-style settlement with some picturesque churches and an original court house which is now used as a local museum. There is also still a gold mine operating here which is one of the largest in Victoria. Ararat has a different cultural feel. While the signs of European settlement can still be found here, Ararat was largely colonised by Chinese settlers during the Gold Rush, and it became the only town in Australia to be developed by Chinese migrants. The Chinese influence can clearly be seen here, and you can explore more about this fascinating history by paying a visit to the Gum San Chinese Heritage Centre, which features displays of artefacts and textiles from the time. Melbourne Private Tours offers you the chance to explore the beautiful Grampians region your way. While we aim to show you all the main highlights of the area, we want you to get the most out of your trip, so we are happy to tailor the itinerary to suit your interests. This way, if you want to concentrate mainly on indigenous culture, or you are more interested in the wineries, you can enjoy an enriching and fulfilling experience with a focus on the aspects you will enjoy the most. For your Grampians tour Melbourne will be the start and end point. We will collect you and your travelling companions in a luxurious, air-conditioned vehicle, allowing you to see this beautiful region in style and comfort. You will also be accompanied by your own highly experienced tour guide, who can add to the experience by explaining more about the culture and history of each landmark, and answering any questions you may have along the way. We can also tailor the length of your stay to suit your needs. If you are visiting Melbourne and you only want a Grampians day trip, we can ensure that you will take in all the main attractions of the region in this short time. However, if you are able to spend longer in this rich, fascinating region, and we thoroughly recommend you do so, we can arrange a Grampians two day tour, including accommodation, which gives you a better opportunity to explore the area in more detail. Whichever way you want to see the Grampians, we are happy to help you. Please contact us for more information and to arrange your trip.